For most surfers a stay at a Mentawai surf camp is the dream and top of the surfer buckets list – tropical islands, heaps of palm trees and world class waves, what more could you want? First off you’ll need to figure out how you’re getting to the Mentawai Islands – which are situated off the West Coast of Sumatra in Indonesia. Flight wise you’ll need to get to Padang Airport (PDG). Internally from Indonesia Lion Air, Garuda Indonesia and Sriwijaya Air fly from many spots (including Bali) so just plug it into Skyscanner for the best deals. I ended up flying from Bali with Lion Air as it included 20kg of luggage and included surfboards as part of that allowance – which was perfect. Internationally a lot of people end up flying into Kuala Lumpur or Singapore and then getting an Air Asia flight from there to Padang. My bro flew from the Gold Coast in Australia through to Kuala Lumpur and then down to Padang which worked out pretty cheap (about $750AUD return + boards) or if you want a bit more comfort airlines like Emirates, Singapore and Ethihad cover the route to Singapore/KL as well. Once you’re in Padang you can then grab the Mentawai Fast ferry out to Siberut (included in any booking with Beng Bengs surf camp) which is the main port before heading out to the smaller islands. 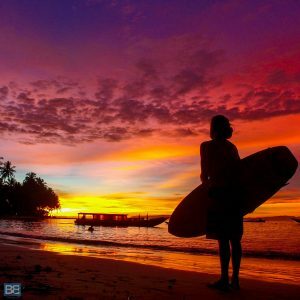 Lets be honest, surfing in the Mentawais isn’t the cheapest surf trip in the world (more about the cost of the camp later) so what does a stay at Beng Bengs Surf Camp get you? It Doesn’t Get Much More Tropical Than This! I ended up staying at Savali Hotel in Padang – check out this link to check rates ands availability – which was reasonably priced (under £30 a night) for a twin room as I was sharing with my bro and it came with A/C and a pool – both of which were much appreciated after a long flight and also the ferry journey back from the islands! Welcome To Beng Bengs Surf Camp! 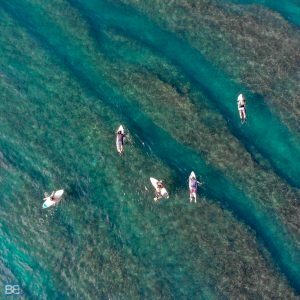 Ok so enough about how to get there and what’s included – what is Beng Bengs surf camp actually like!? I’ll be totally honest, on their website things looked like they might be a bit basic, but I was super stoked to discover the camp was clean, comfortable and was exactly what I was looking for! With its postcard perfect beach front location, an epic beach bar (new for 2018) and A/C rooms it was the perfect base for a tropical surf adventure! Italian owners Massimo and Cristian were super accommodating and helpful and all of the local staff were equally so. The vibes were exactly what you’d expect from this kind of location – smiley, friendly and nothing was too much trouble for anyone! For those not wanting to totally detach from normal life there camp has wifi (admittedly a paid extra and not the cheapest at $50USD per stay) but there was also plenty of space to chill or socialise amongst the bean bags, hammocks and beach bar decking. With a max of 12 surfers at a time (split across 2 double rooms and 2 quad share dorms – all with A/C) it’s more like a patchwork surf family than a surf camp and you’ll quickly get to know the other guests who you’ll be sharing heaps of waves with! There are even hot showers – although personally the cold outdoor shower is a much more refreshing option after a day in the salt water and sunshine! In regards to location it’s an hour local boat (provided by the camp) from Siberut after your ferry out from the mainland and it’s perfectly nestled amongst the palm trees. Surf spot Ebay is situated 150m in front of the camp (you can watch it from the bar) and just around the corner from that is Pit Stops, which is another 5 mins walk along the beach or through the jungle trail. Based on the island of Pulau Masokut it’s right in amongst all the best breaks of the area – which I’ll get to in a moment! It might seem weird that I’m dedicating an entire section of a surf camp review to food, but trust me – it’s well deserved. Once you’re served your first meal at the camp you instantly know the owners are Italian – the food is on point! Not just on quality and style but also on portion size. Our first dinner at the camp was a 5 tier home made lasagne which each portion about the size of a brick…that’s ALOT of food! And of course the side salad as well! You’re going to be well fed throughout – which is ideal as two big surfs a day mean you’re going to be heaps hungry and want to be well fuelled! From a range of pasta dishes to fresh pizza and garlic bread there’s a lot of Italian influence in the meals – but you’ll also have a good feed of local dishes too. Make sure you try the sambal too (a local chili sauce) which they make to perfection – not too spicy but packed with amazing flavour and freshly made each day. And of course the breakfast spread is just as impressive – with museli, toast, cereal and fresh fruit on a help yourself basis alongside a main breakfast dish each too. Going hungry at Beng Bengs is not going to happen! Also it’s worth noting here that as a veggie I was well catered for as well! But obviously the main reason you’re heading out to a surf camp in the Mentawais is to score the waves of your life (this place isn’t for those learning to surf!) and Beng Bengs Surf Camp is right in amongst the action! 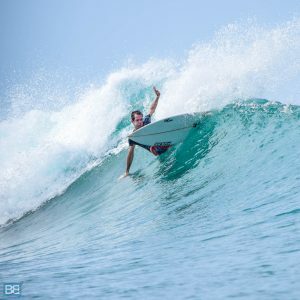 The closest surf spot is Ebay which is just a 150m walk from the camp and you can check it from the beach bar whilst eating your breakfast or enjoying a cold Bintang! This epic left hander peels across the point and is the perfect spot for an extra early morning session or cheeky lunchtime dip if you have the energy! Each morning and afternoon the 2 surf camp boats will head out to the surrounding waves too – which include world class waves like Rifles, Bank Vaults, Pistols, Kandui Lefts as well as more mellow waves such as Burger World, Good Times, Beng Bengs (my personal favourite) and Pitstops. The great thing about the two boats is that if you’re not really at the level of charging overhead barrels you have the option of heading out to some of the mellower spots, which is perfect as the surf camp attracts a good mix of intermediate and advanced surfers. Out of the all the spots we hit up my favourite session by far was the one at Beng Bengs – not only because it’s a super fun left hander (and during the early season it’s mainly the right handers that are working!) but because of the fact we scored it just to our crew. Just five surfers, enjoying perfect waves with a backdrop of palm trees and white sand beaches – it was everything I’d expected from the Mentawais! 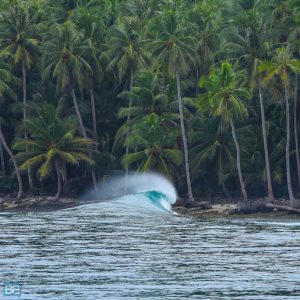 If you’re heading to the Mentawai Islands for really world class surf you’ll want to sort your trip during peak surf season between May and September. If you want smaller but still pretty consistent waves then the shoulder season of March/April and October/November are more manageable but still heaps of fun. 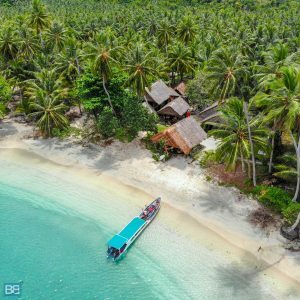 A 7 nights stay at Beng Bengs Surf Camp will set you back £522 however I’d personally recommend a minimum stay of 10 nights (£838) – but you can technically stay as long as you want at £86 per day. The only thing you need to keep in mind is the fast ferry from Padang only departs/returns on Tues, Thurs and Sat. I can hands down say that Beng Bengs is well worth the surf trip splurge. Sure this isn’t going to be your cheapest surf trip ever (although it’s still heaps more budget friendly than a Maldives surf resort!) but surfing in the Mentawai Islands on a budget is notoriously hard and most camps in the area will set you back double the price! 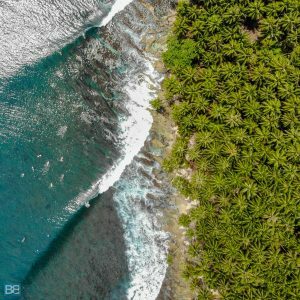 In terms of food, comfort, vibes and of course waves I wouldn’t hesitate to recommend Beng Bengs to anyone heading on a Mentawai surf trip – many people at the camp were returning customers and I’m already planning my next visit too! Have you been surfing in the Mentawai Islands? Which surf camp did you stay at and was it any good?! The pictures are so nice, everything looks like it came out of cool movie about surf and “finding yourself” on a vacation. This looks so amazing, too bad my surfing skill are not on point, because the place seems so cool ! hahaha Massimo is a legend though, he can totally pull it off! thanks heaps Drew – heading that way anytime soon?